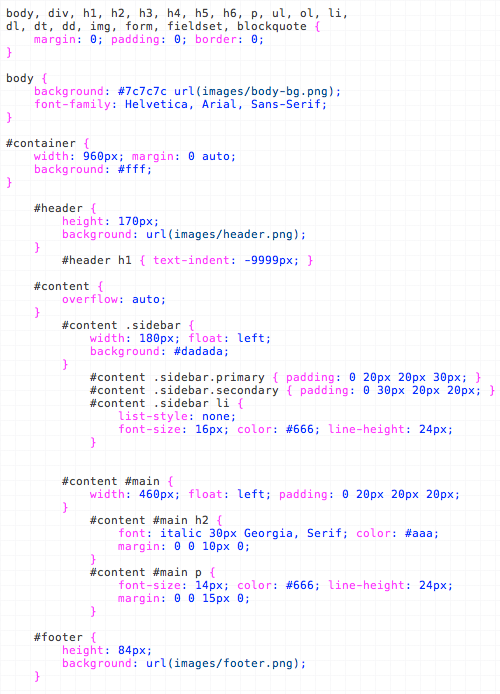 Here’s a quick example I’ve put together to show a typical website layout. 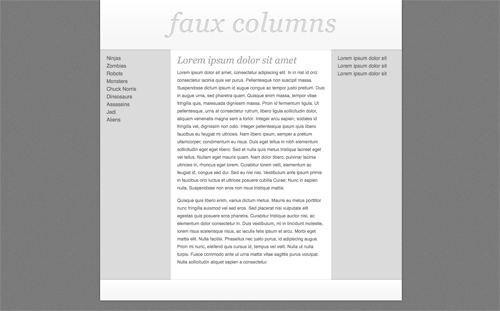 The design employs three columns comprising of two grey sidebars and the main central content area. 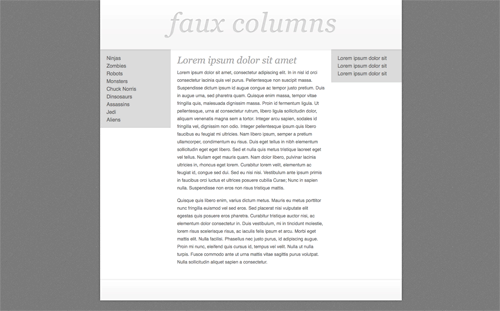 Here’s the HTML for the layout, showing a content div containing the two sidebars and main center column. 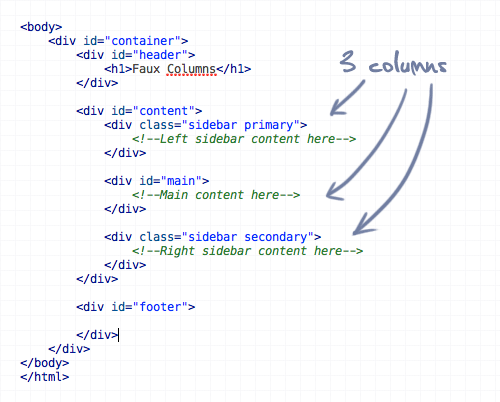 To code this up we would simply float three divs side by side, and add a grey background to the sidebars, right? Fail! What happens is the sidebars will end at different heights due to the varying length of content in each. One of the easiest ways to solve this problem is to take a step back from the code and look at how the design can be alternatively sliced to give the impression of equal height columns. Instead of attaching a grey background to each sidebar, we could take a long slice that includes the whole width of the design. When this slice is attached to the containing div, it gives the impression of a three column layout, but isn’t affected by varying amounts of content. Being just one image attached to the container means that the graphic will repeat for the entire height of whichever is the longest column. Great! All this time i was looking for this. Never thought we could do that. No wonder most of my hand-written theme sidebars are bad. Anyway, thanks for sharing! Loved the tutorial. A complete beginner. Followed the html and css. How do I still create the header.png, body-bg.png and footer.png? I can use photoshop to create headers say 814×234. Is it the same with above? Are these graphics liquid? Would love answer to these queries. I just want to say that you’re a freakin’ lifesaver! I’ve been trying out all sorts of different faux column techniques and none worked for me except this one! instead of using backgroundimage in #content we can use grey background Color and in main content area we can give white background color. I like the way you set up the notes to relate what code is relevant to what parts of the view. I think Front Page 98 has some cool code for frames and tables. If you want I could paste some in for you that might help? What’s the best way to do it without images? Thanks. Been searching for this for ages. I wonder if there are more better ways to do this. theres a few different takes on this, background overlaying being probably the most simple.. Honestly the most elegant solution i came across was to correct it using a little jquery. gregor- i like that tip. thank you. Or God Forbid, you could just tables and assign a class to each of the columns and be done with it. Really, Toby? Don’t be silly. 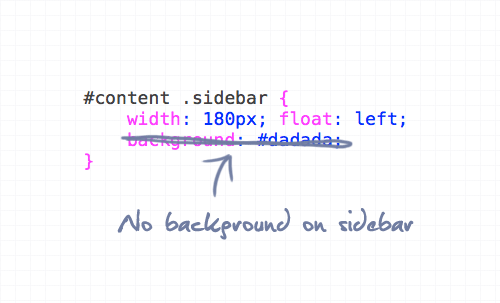 There are certain cases when using CSS to apply styles to a TD is much easier to achieve this result. Not hard at all, but as we are all aware that is not the point. It’s a misuse of the table element. You say, why not just use a table for simplicity. I say why not just use a little ingenuity to keep your mark up correct. Honestly, if it’s your trade you should make the effort to do it correctly. Purist or not. Cutting corners will leave you behind the pack who are willing to do it right. ….and every navigation I’ve seen that uses UL is a misuse under that same criteria you just described but it seems everyone (including both myself and yourself) use it in that way. 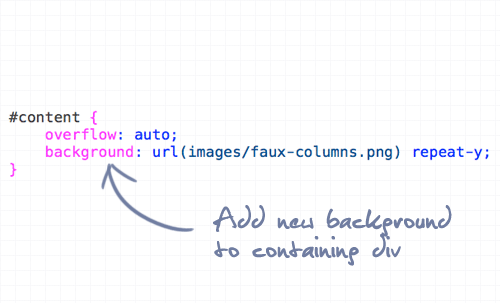 To clarify: I’m not some Frontpage-using, inline-styling hack. I just think in this particular instance a table makes sense. I really don’t use them anywhere else. uh… how is a navigation in any way NOT an unordered list of items? It is.. and it is perfect use of the tag ? tables are used for tabular data, which.. a 3 list column layout is not. Honestly, I can’t think of a way to describe it.. You’re argument is just incorrect mate, sorry. A variable height column is done better making CSS tables i think. You don’t have to float anything, it has less code to do so and is a cleaner approach, not having to worry about an image load to set the height for you. Only problem is that IE of course doesn’t read it so well. 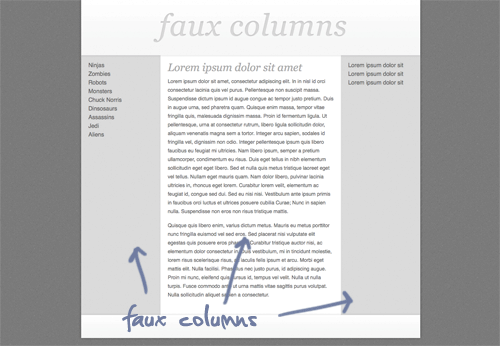 You set the “main” container to display:table; and each column underneath to display:table-cell; and give each the width you want (make it variable width by setting a min-width and a max-width but that might not work in IE im not sure), and set the right columns to have a margin-left of the same size as the widths of the ones before it. well, thats was a really good explanation, nicely done, why i never thought of it before is still a mystery but now i can use it for my next design. 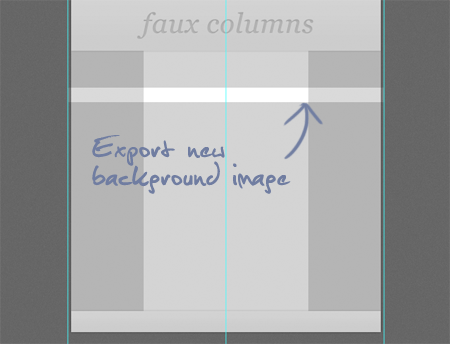 It’s a good solution but what about variable width columns? Nowadays there are a lot of different screen resolutions, most of them widescreen, and using a 960px fixed width makes your site look a bit ‘small’ in some of them. Nice tutorial in any case! Ah…I have always wondered if there was a better way to achieve equal height columns other than a background image, but now I know :) Thanks!